Over the weekend I went to A Pea in the pod for the first time. They had a really great sale going on so I bought a few things. Maternity clothes can be so expensive! I did get a great pair of J.Brand maternity jeans on major sale. But I really feel most comfortable right now in dresses. I am 18 weeks and I feel like I woke up yesterday and my belly almost doubled in size. I think I had a major growth spurt. We are so close to the half way point! I have gained 8.5 pounds and I feel huge! I finally started walking again last week. I have been to nervous to work out! I am feeling great pretty much back to my normal self. My appetite is still a little weird and a lot of foods still gross me out. The only thing I have really craved up to this point are waffles. Which is weird because I never ate waffles before. I can feel her moving a lot more now! I think she had a growth spurt also. Yesterday I was laying on my back and I even saw my stomach move. Which was very exciting. I love feeling her move it is the best feeling! We ordered her crib and a glider for her nursery over the weekend and today I am ordering her dresser. I can't wait to get it all and see her room start to come together. I find myself wanting to shop for her and her nursery all the time and never wanting to shop for myself! Gorgeous look! :) I love the dress and the necklace! Such a fabulous look, love, love, love! LOVE that navy dress and necklace on you! So pretty! I bet it is fun shopping for furniture for her room! You will have to show us when you are all done decorating! Beautiful outfit, totally suits you and your belly bump :) You look so cute! This dress is perfection on you! gorgeous outfit and I love hearing all of the fun little happenings of you and your babe. can't wait to see pictures of the nursery! Such a perfect pregnancy dress! Love your necklace, it's gorgeous! 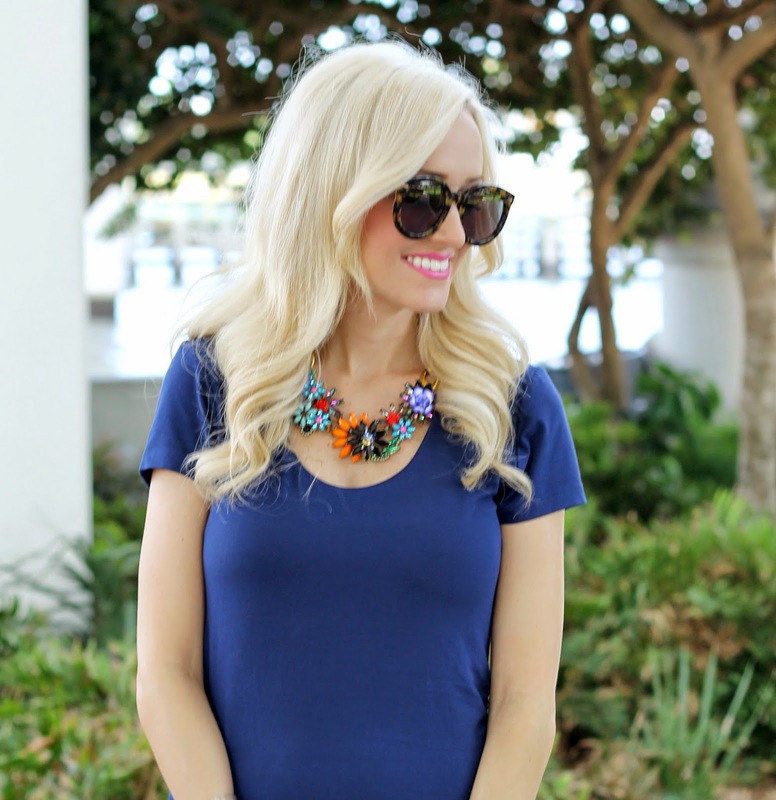 That navy is amazing and your necklace is incredible! Great addition with the blazer! Oh so precious! You look lovely! oh my gosh how exciting! love that dress on you! I love the statement necklace here! You are absolutely glowing! This is beautiful on you!! That dress looks so unbelievably comfortable. Really cute to see your baby bump :) Hope all is well with you!